Go on a super reading mission with the LEGO (R) DC Super Heroes characters in this fantastic book LEGO book for children learning to read. Exciting and action-filled, LEGO DC Super Heroes Heroes in Action follows your favourite LEGO DC Super Heroes as do what they do best - save the day! Follow LEGO Batman and Robin as they swoop and soar through Arkham City, fighting baddies and helping people on the way. Plus meet LEGO Superman and Wonder Woman as they join the adventure. Combining DK's four-level reading scheme with the popular LEGO DC Super Heroes theme, LEGO DC Super Heroes Heroes in Action is at Level 1 with limited vocabulary and lots of repetition to engage young fans and build their literacy skills. 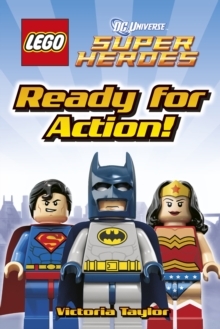 This engaging LEGO DC Super Heroes story will help kids learn to read - and to love reading. LEGO, the LEGO logo, the Brick and Knob configurations and the Minifigure are trademarks of the LEGO Group. (c)2014 The LEGO Group. All rights reserved. Produced by DK Publishing under licence from the LEGO Group.